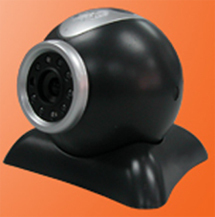 See More Wireless Cameras Here This 2.4GHz wireless ball shape camera has a built in microphone so it can transmit video and audio to a wireless receiver, it also has infrared L.E.D's giving it approx. 3M night vision, its size makes it a good choice for someone wanting a discrete camera for video surveillance use or simply monitoring indoor activities. The camera can be powered from a 9v battery via the battery clip (included), a PP3 (also included) will power the camera for approx. 2 hours.